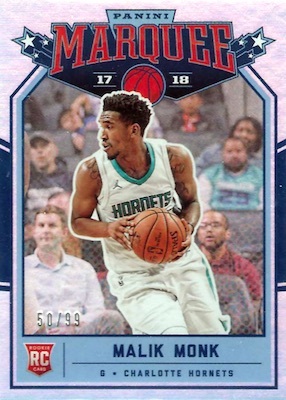 Relying on the belief that there can't be too much of a good thing, 2017-18 Panini Chronicles Basketball goes all-in on the 2017 NBA Draft class. In doing so, the new set features multiple Panini brands under one roof. Debuting on the court, the Chronicles line initially began with the 2017 baseball set. 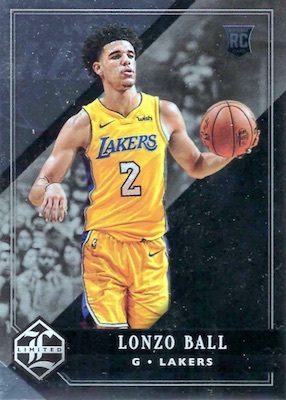 Featuring one autograph or relic per pack, and three per box, there are also three rookie cards and three parallels/inserts in each pack. 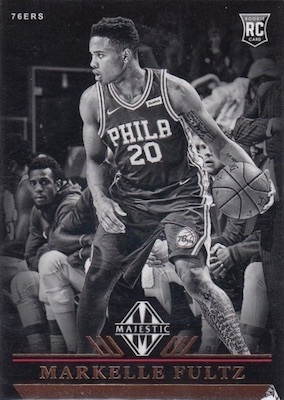 Combining a large selection of brands, the 2017-18 Panini Chronicles Basketball checklist includes base rookies for Gala, Gold Standard, Limited, Majestic, Marquee, Momentum, Panini Basketball, Pinnacle, and Titanium. 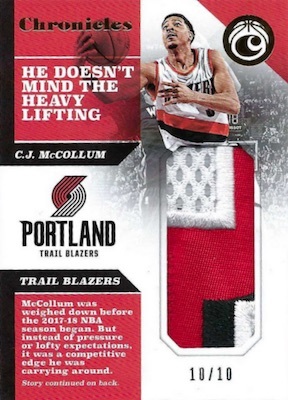 According to Panini, this is the only place to find rookie cards from these brands for the '17-18 season. 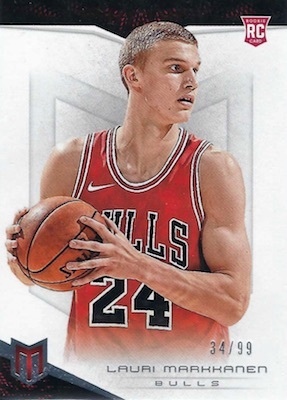 Split between autographs and relics, the 2017-18 Panini Chronicles Basketball hits come three to a box. The Chronicles Autograph and Chronicles Swatches inserts both display considerable text about the player. In addition, the signed cards have Pink (#/25), Gold (#/10) and Gold Holo (1/1) parallels. 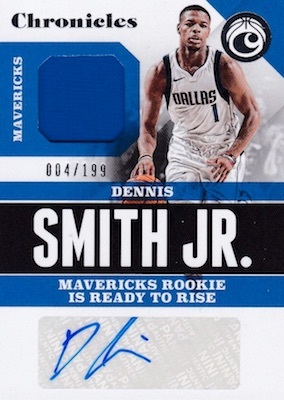 Rookies are also featured as the first-year players get the call in Chronicles Signature Swatches. 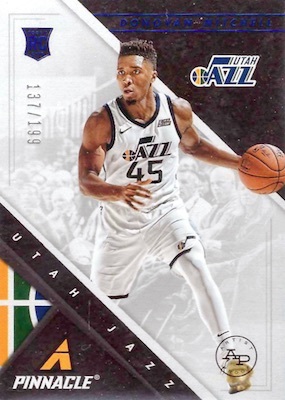 2017-18 Panini Chronicles Wayne Selden Jr. Titanium Rookie 1 16! 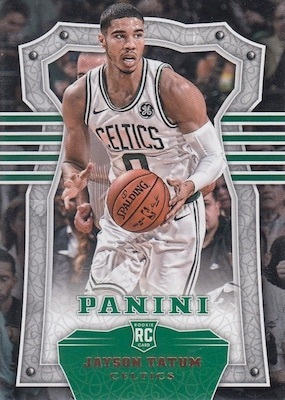 2017-18 Panini Chronicles Jayson Tatum Pink Rookie 90 99! PARALLEL CARDS: Red #/299, Blue #/199, Purple #/149, Pink #/99, Gold #/10, Holo Gold 1/1. 25 cards. Serial numbered #/99. Shop on eBay. PARALLEL CARDS: AU #/49, Black 1/1. 25 cards. Serial numbered #/8. PARALLEL CARDS: Tier 2 #/49, Tier 3 1/1. ARTIST PROOF PARALLELS: Red #/249, Blue #/199, Silver #/99, Gold #/10, Holo Gold 1/1. PARALLEL CARDS: Red #/249, Blue #/199, Silver #/99, Gold #/10, Holo Gold 1/1. PARALLEL CARDS: Red #/249, Blue #/199, Drive Silver #/99, Force Gold Die-Cut #/10, Power Holo Gold 1/1. 25 cards. Serial numbered #/249. Shop on eBay. PARALLEL CARDS: Starbursts #/149, Artist Proofs #/10, Above and Beyond 1/1. PARALLEL CARDS: Blue #/149, Gold #/10, Black 1/1. PARALLEL CARDS: Red #/149*, Blue #/99 or #/75, Purple #/49, Pink #/25, Gold #/10, Holo Gold 1/1. *All subjects not in Red parallel. * See below. 38 cards. Serial numbered #/149. PARALLEL CARDS: Blue #/99 (No Rabb*), Pink #/49 (No Rabb*), Gold #/10, Holo Gold 1/1 (No Rabb*). 60 cards. Serial numbered #/199. PARALLEL CARDS: Pink #/99, Gold #/10, Holo Gold 1/1. 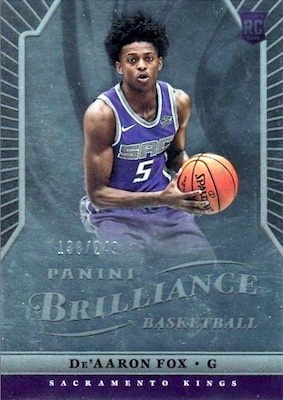 View the full 2017-18 Panini Chronicles Basketball checklist spreadsheet. I am one of the few people on the Blowout forum who seems to really be looking forward to seeing these. I typically collect based on what designs appeal to me most and not how many hits I get. So anyone reading this should not take this as a guide for whether there is money to be made or not! I really liked Marquee and Brilliance in 12-13, Titanium in 13-14 and generally like Gold Standard and Limited. I hope these are as nice as I think they might be. I love that Panini is bringing “expired” products into this one. The autos and jerseys also look sweet. Im really looking forward to this. Instead of putting out a bunch of different releases this idea of a handful of them in one box is great and I hope they keep this up every year with different sets in it each time. 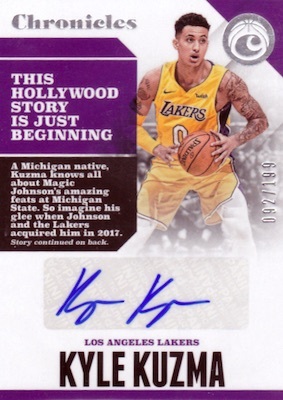 To have a broad spectrum release and only do the autographs and jerseys in the boring Chronicle design is a big miss by Panini. 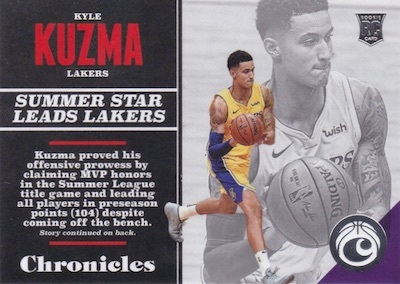 To not have Kuzma and Mitchell in many of the subsets is also a big miss. This is a boring product that could have been as good as the Baseball release of Chronicles. Yawn! Pass on this one. Most cards are chipped and have white showing. I would love to get a refund on this one. I wont ever buy another. All autos are stickers. It should be at most $90 per box. 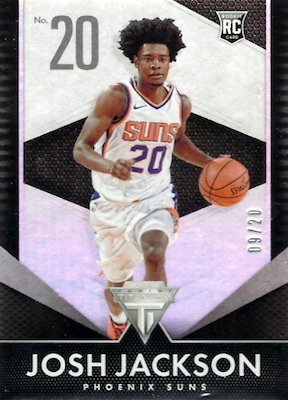 A lot of rookies in this set! Best RC in a generation and love all the different RC brands. 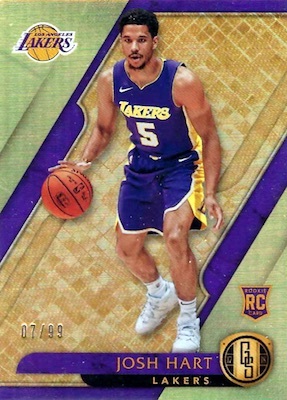 Didn’t hurt that I hit the Jason Tatum 3/3 Titanium RC. Here’s hoping for a great grade on this MONSTER card! !